Clean, airy, light and bright, crystal white quartz countertop is one of the most popular choices in new home construction and kitchen renovation. Websites such as Pinterest and Instagram have led to an increased popularity in all white kitchens. They photograph well, and they are upscale. These high-end kitchens are often referred to as Insta-perfect, and it’s not just young homeowners looking for a white kitchen. It’s often the little details that make the biggest difference, and builders know they can add crystal white quartz countertops to any kitchen to attract buyers. Why Use Crystal White Quartz? Open and airy kitchens don’t go out of style. They maintain their chic and streamlined look for decades, and that’s something buyers love. The idea of buying a home with a timeless kitchen is appealing. It’s also easy to incorporate white kitchens into any design scheme, which makes it easier for potential buyers to see how a spec home can accommodate their own tastes and design ideas. Kitchens created with an all-white concept are brighter, which makes them appear larger. They also encourage buyers to keep their kitchens cleaner. Stains and grime are easier to see when they’re on a white surface, which encourages homeowners to maintain a cleaner and more sanitary kitchen space. This is appealing for any home chef. Crystal white quartz countertops are easy to maintain, which is preferable to homeowners. Not all high-end materials are this easy to maintain, which can be a turnoff for some buyers. They’re cleaned easily using a mild cleaner, and they’re almost entirely maintenance-free. Unlike materials such as granite and marble, quartz is not a porous surface. This means it doesn’t require any special sealing, cleaning, or maintenance. It’s durable enough to withstand the heat of a hot pan or plate without burning or discoloring the countertop, but sudden changes in temperature can cause the counters to crack. Materials such as granite require ample maintenance, from regularly being sealed to requiring specific cleaners to prevent the porous surface from being damaged. Homeowners with granite countertops often find it’s more work to care for their surface than they’re bargained for, and sometimes it’s too late to undo the damage that’s been done because of a lack of proper care. 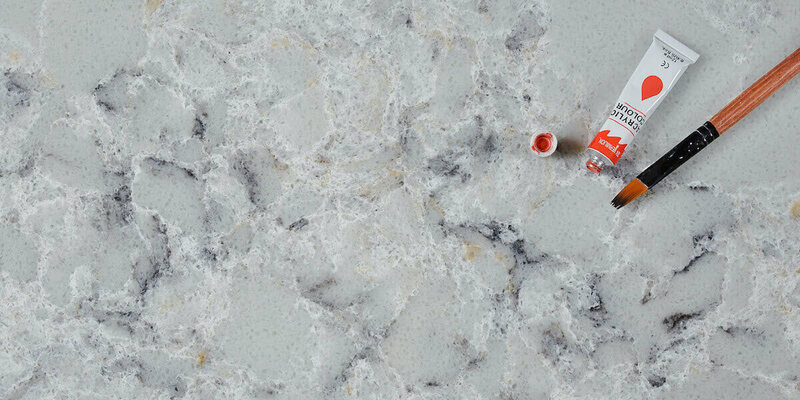 Due to the fact that quartz is non-porous, it’s cleaner than other countertop surfaces. Germs and food particles cannot seep into the material where it gets stuck and potentially contaminates other food. Some quartz brands come from manufacturers that have an NSF-certification, which is what is required to consider the material safe for use in a commercial setting. Another excellent reason to use crystal white quartz countertops is the price. It’s comparable to other high-end materials, and it’s longer-lasting. You get more value for your money when you use and care for your quartz correctly. Every quartz countertops manufacturer is different, but the average price of quartz is $55 to $155 per square foot. The average cost of granite is $45 to $200 per square foot, and the average price of marble is anywhere from $75 to $250 per square foot. You get a product that’s just as gorgeous while also being a lot more affordable when you go with quartz. Crystal white quartz countertops are man-made, which also means it’s possible to perfectly match the slabs used throughout a home. If a homeowner wants their kitchen counters to match their bathroom counters, it’s easy to do so with quartz. Every slab is perfectly matched, unlike natural stone. Natural stones like granite are different on every slab. You might get one that’s similar, but each slab has a different variation and even color pattern. It’s impossible to match them perfectly. 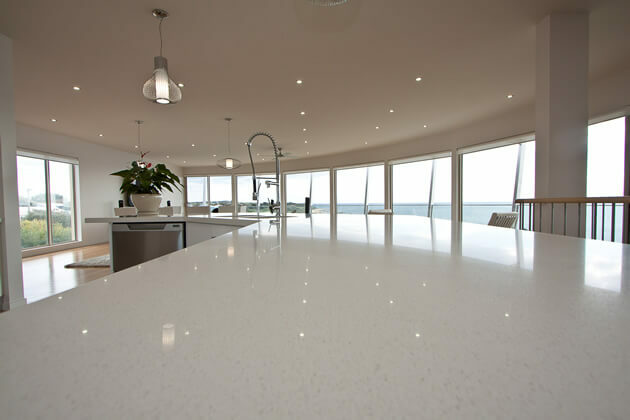 Choosing crystal white quartz countertops is a wise decision. This material is stylish. It’s affordable, and it’s also easy to maintain. Homeowners choose it for the easy maintenance, and builders choose this material because it’s chic and upscale. It lends a touch of sophistication to an all-white kitchen, and it can make a room look more spacious. Furthermore, it’s timeless color is appealing to buyers from every generation, and it’s unlikely to go out of style anytime in the near future. This entry was posted in Quartz Countertops and tagged quartz countertops.